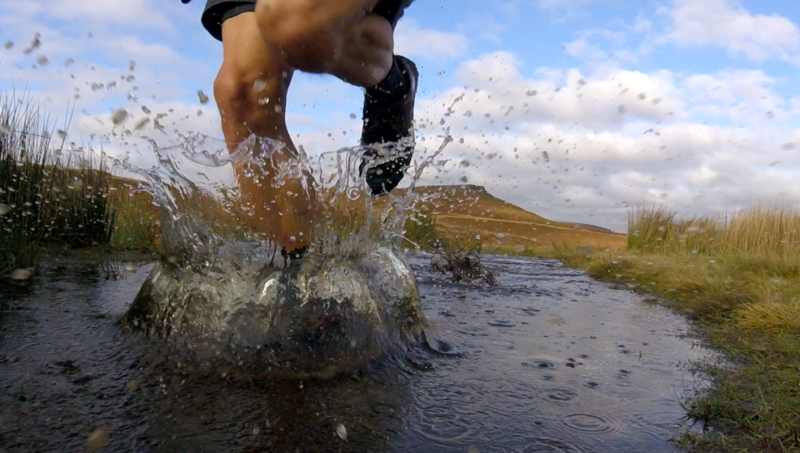 Fell running in winter results in wet feet, there’s no avoiding it! Over the years I’ve tried different brands of so called “waterproof” socks but found that after a couple of outings they cease to be waterproof, water that does get in stays in and you end up with a heavy, soggy sock. Yes your feet stay relatively warm but they certainly don’t stay dry. Also, waterproof socks are expensive so when I threw my last pair away I wanted to replace them with something cheaper that would keep my feet warm if not dry. Someone recommended Rooster Sailing neoprene socks as a cheaper alternative to waterproof socks so I thought I’d give them a try. (I got the 3mm neoprene Superstretch Wet Socks) As the name suggests, these socks are designed for sailing rather than running and my first thought on seeing them was that the stitched seam that runs under the heel would be uncomfortable. However I needn’t have worried as it was much less noticeable than I feared. The extra thickness of the 3mm neoprene means that your shoes will feel tighter than normal and so you might struggle if your shoes are already a tight fit. The stretch of the material makes the socks easy to get on and off and the top extends to the lower calf and gives a snug fit. On short runs I was pleased to find that my feet were warm and damp at the end but the real test would come on longer runs in very cold conditions. 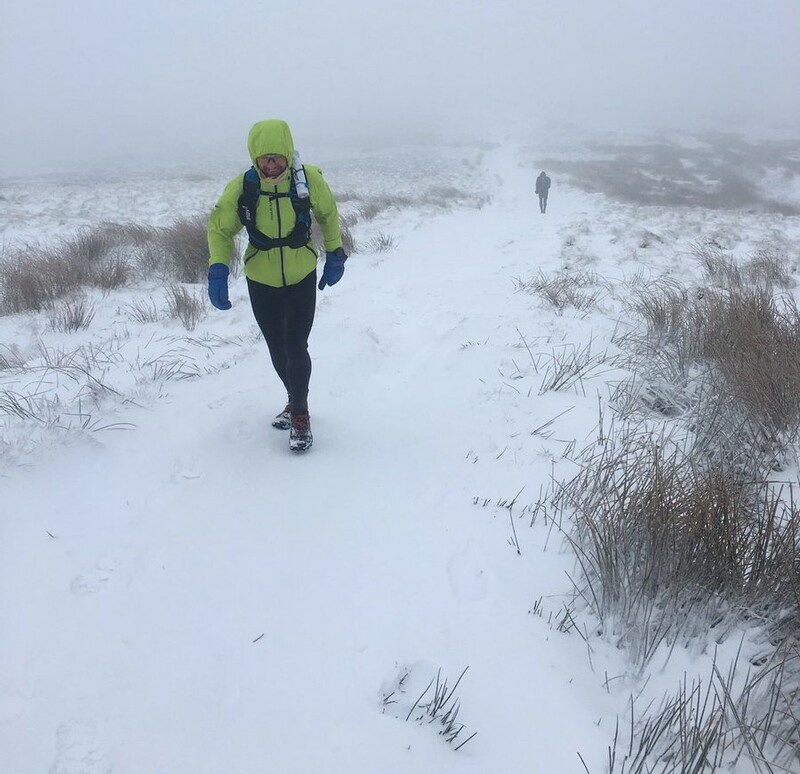 Luckily the Trigger fell race provided an excellent testing ground; 24 miles across high moorland with melting snow! After four and a half hours with wet feet from the numerous river crossings I was very happy that I could still feel my feet! Other runners were complaining that their feet felt like blocks of wood, mine were fine. 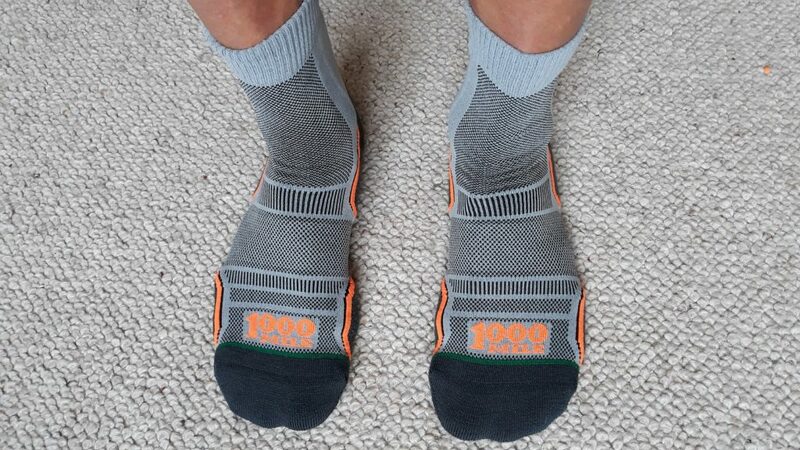 Since then I’ve used the socks for long runs in bad weather and always found that my feet end up warm and damp rather than cold and wet. 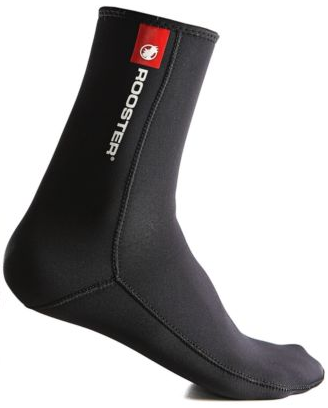 The Roosters aren’t the cheapest of neoprene socks, (a pair will set you back about £20) but they feel robust and well made and they are still significantly cheaper than a well known brand of waterproof socks. The super stretch material fits the shape of your foot without any baggy areas and so gives a comfortable fit. It is worth keeping your big toenails trimmed to avoid wearing a hole in the socks – which I seem to have done with previous waterproof socks – although unlike waterproof socks a hole in the toe won’t compromise the effectiveness of the sock. I can certainly recommend Rooster Sailing Neoprene Wet Socks, I’ve worn them in some pretty harsh conditions this winter and I haven’t had cold feet! The great thing about fell running is its simplicity. No expensive kit is needed, there’s no need to keep updating to the latest design, it’s just a case of get dressed and go. So there’s nothing much to consider when it comes to choosing a pair of socks, right? Well that’s what I thought until I went to a talk by experienced Ultra Running athletes, sharing their knowledge with runners hoping to complete the Mammut Ultra Tour of the Peak District. The fact is that during an ultra distance race your body has enough to deal with and so avoiding anything that could slow you down is crucial, things like blisters for example. 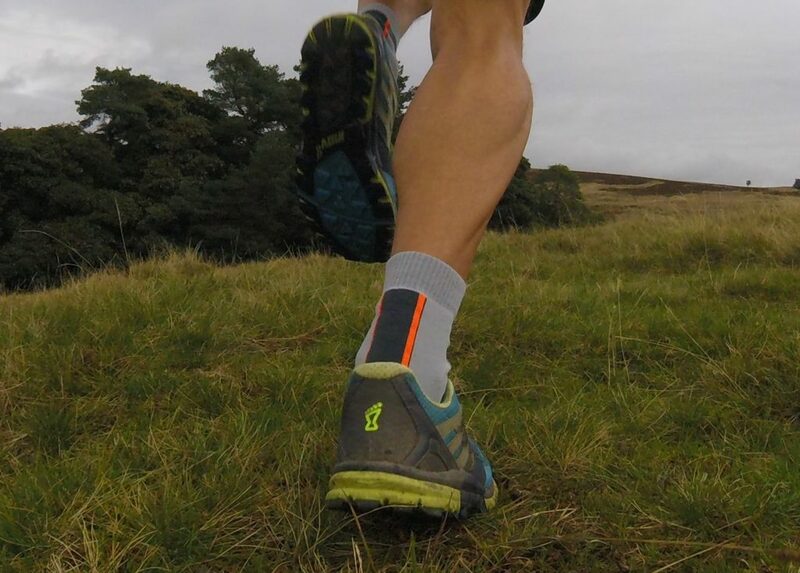 An ill fitting sock might not cause you too much trouble on a short run or race but what if you’re on the go for 10 hours or more? That little ruck in your sock, that little bit of skin rubbing on skin is going to cause a problem. 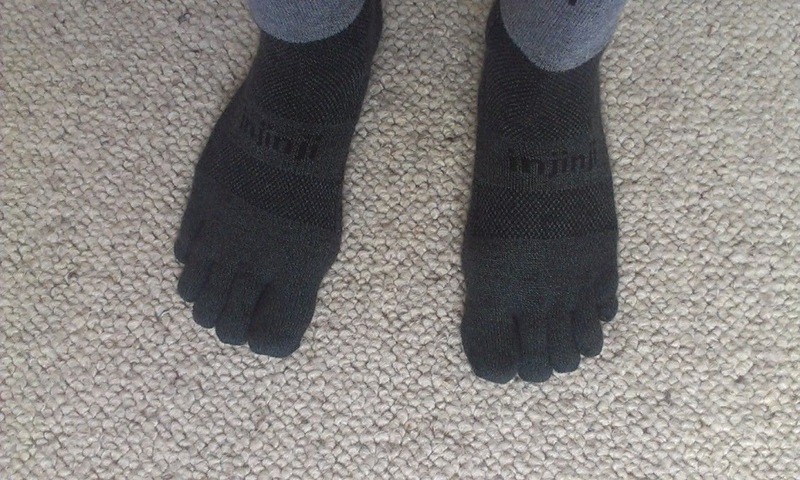 That’s where Injinji toe socks come in. 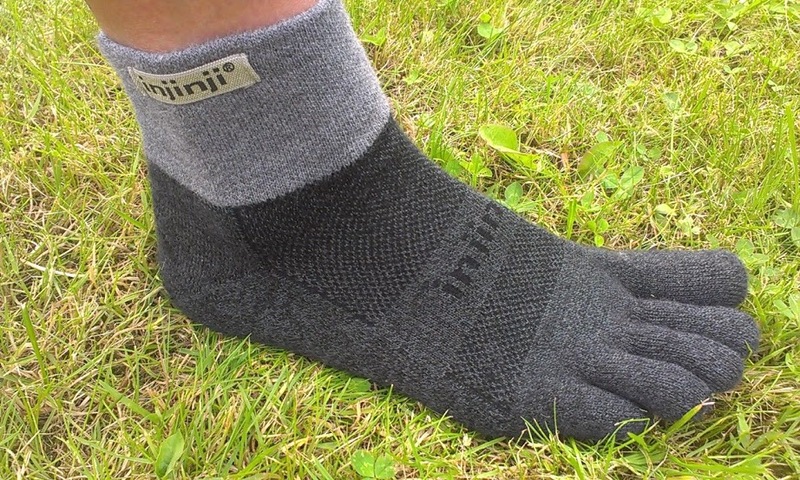 Injinjis are designed as left and right foot specific socks with each toe having its own little bit of sock – just like gloves but on your feet! The anatomical shaping helps keep the toes correctly aligned and prevents them rubbing on each other. Sweat is also removed from the toes and thus the chance of getting blisters is reduced. The material is a mix of Coolmax, Nylon and Lycra giving a snug fit with increased reinforcement at the heel and toes where most of the wear is likely to occur. What are they like to wear? My first thought on seeing them was “they look odd!” Having had thousands of pairs of socks I have got used to what they look like – and these look different, but that’s no reason not to wear them. The main thing you notice is when putting them on. 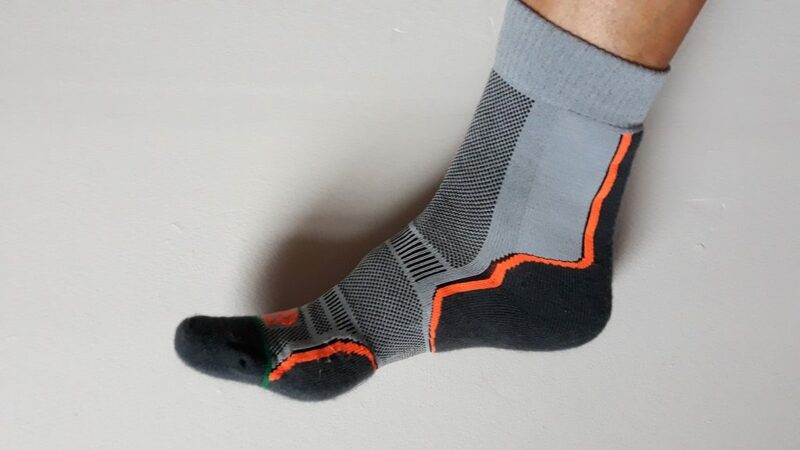 After decades of putting socks on without thinking you have to actually concentrate on what you’re doing and line up each toe with its own compartment. This was a little bit fiddly and certainly not something that you could do in the dark whilst still half asleep! 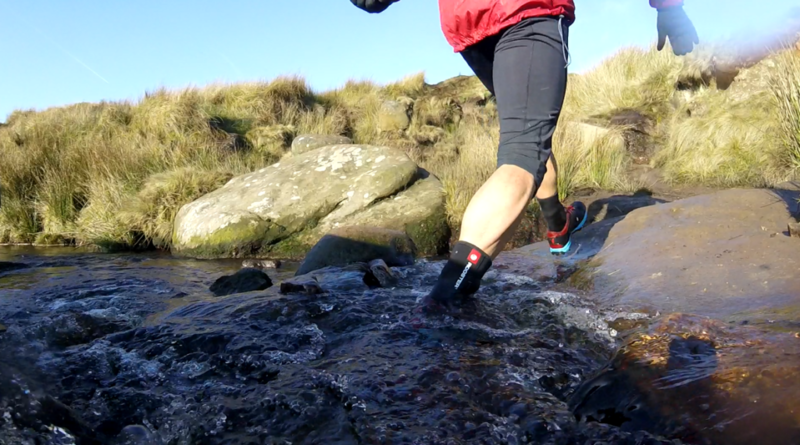 Overall I liked the Injinji toe socks and will be using them for long days out fell and trail running in the Peak District where the real test will come – but it will take more than gloved feet to turn me into an Ultra runner!